Coleslaw is a bit of a controversial subject in my house. I hated coleslaw a child. I knew nothing other than the standard supermarket tubs and it just looked like weird creamy slop that I didn’t want to eat. 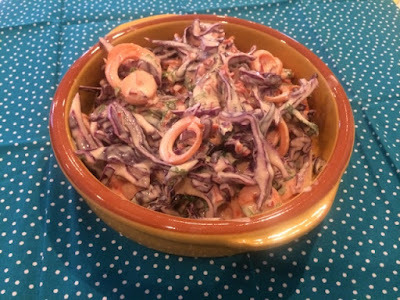 It wasn’t until later in life when I tried slightly less unappetising looking coleslaw that I began to come round to the idea. My step-daughter seems to have a similar opinion to my younger self and The Boyfriend’s a bit borderline. Raw veg can be so tasty and if you go light on the dressing it becomes a lot more pleasant to eat. 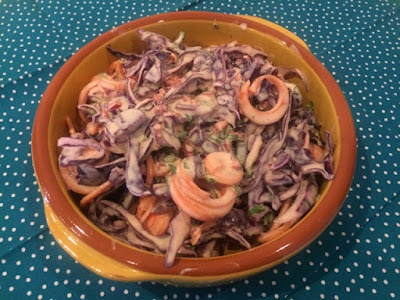 Once I’d grown up and realised that coleslaw didn’t have to be white gloop I really came around to it and now love it on the side with some salad or used in a nice ham sandwich or wrap. Americans are quite big on ‘slaw’ and I served this particular batch up with a ‘Southern style’ chicken dinner, alongside sweet potato wedges, grilled corn on the cob and a juicy roast chicken. Coleslaw also has a terrible reputation for being really unhealthy and fattening, but it’s actually quite easy to change this. Firstly, as I’ve already said, go easy on the dressing. You’re after fresh crunchy veg coated in a light layer of dressing, not a few pieces of cabbage floating around in a sea of mayonnaise. Secondly, don’t use mayonnaise. There are far less fattening ways of making a creamy dressing. Yoghurt is a brilliant substitute. You can even go super healthy by using a fat-free one. In this instance I’ve used a low fat natural yoghurt and added a splash of milk to smooth out the consistency a little. 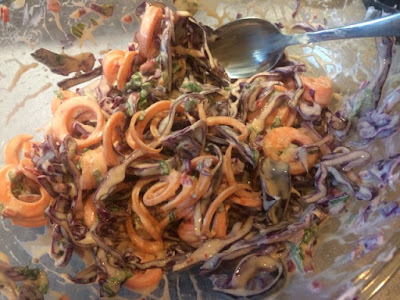 I’ve included approximate amounts for the rest of the ingredients involved in this dressing as it’s really about personal taste, add them a little at a time, taste as you go and add a little more of whichever ingredient you see fit. I’ve tried to make this a bit of a coleslaw with a twist with the inclusion of chilli and a touch of mustard in the dressing. It’s by no means really hot but if you’re not a fan of the heat you could leave one, or both of these out. This is a very adaptable recipe that you can completely customise to suit your own tastes. I love red cabbage but if you’ve got a white one to use up and you don’t want to go out and buy more ingredients, by all means use the white cabbage. Most hard crunchy veg will work, use what suits you. 1. Firstly prepare your veg. 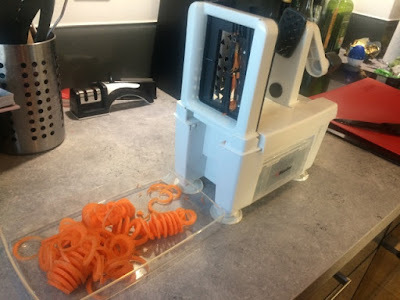 If you’re not spiralising, just keep everything finely sliced. 2. Throw all the veg into a bowl along with the dressing ingredients. Have a taste and adjust seasoning to suit your taste. If it’s too creamy it may need more vinegar or lemon juice. If it’s too acidic, tone it down with a touch more yoghurt. If it’s bland more salt and pepper with help. 3. Dish up. It’s as simple as that. Serve in sandwiches/wraps/burgers, alongside a roast chicken, with a picnic or packed lunch or as part of a party buffet. It’s uses are endless.